Welcome to the Rockford Auburn High School Class of 1966 MyEvent page. 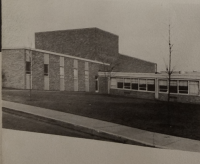 Details about the 50th reunion will be updated here. We just got started, but will have more detail soon, including pictures, attendees, etc. Please come back soon. Wow! What a wonderful weekend it was! The Friday night tour of Auburn as arranged by Jack Stroup turned out to be a fantastic way to kick off our reunion weekend. A good crowd of over 40 classmates and spouses showed up. We ended up with a substitute tour leader, but probably the best one we could have had. He had so much enthusiasm and energy, and couldn’t have been more accommodating. At times our group got kind of strung out as he let us through any place we wanted to go, but I suspect even those who were dawdling were simply lost in conversation with old friends. Did you know the front entrance to the school is no longer on the Auburn Street side, but is now on the Pierpont Avenue side — at the entrance to the new indoor field house? And that there’s no longer a school office, but there are multiple offices with each hosting the leadership of a career track? And that the cafeteria is now on two levels? Things have really changed. The social get-together Diane Hurd Risley hosted at the Pow Wow Club in Tullocks Woods was packed with more than 40 people. If any more had come to spend time they would have had to sit at the picnic tables outside the club, and the committee had even prepared for that by having votive candles light up the tables. The “light” supper was very tasty and just right. Classmates clustered in groups for long chats, but also broke away to spend time in other clusters or in one-on-ones. Foreign exchange student from Iceland Jón Júlíusson and his wife missed the school tour due to having gone out to eat with Phil Pedersen but showed up for the social. It was wonderful to chat with them again. They also went to the Saturday morning breakfast and the dinner/dance. The Saturday morning breakfast arranged by Karl Kegel at the Johnny Pamcakes II Restaurant (no, that’s not a typo) next door to Karl’s (The World’s Oldest Family Owned) Harley-Davidson Dealership was a GREAT time of conversation and dining for fifteen classmates and spouses who didn’t do the golfing. Some of us had a hard time getting away sooner than two hours. There was even a coincidental conversation there with an Auburnite who’d celebrated his 50th-year class reunion two years prior and assured us the meal at the Venetian Club would be great. The planned motorcycle ride Karl was ready to lead didn’t happen because the few people who’d indicated they were going to ride decided to take a rain check. Maybe we can do that some other time — even between reunions. I’m not able to give a first-hand report on the golf outing because I wasn’t there. All I know is that Duke Drayton’s arranged event got moved from Ingersoll to Sinnissippi due to a double-booking mistake at Ingersoll, with the result being the golf fees were forgiven. Perhaps one or more of you golfers can chime in and give us a report. The dinner/dance. The committee members who painstakingly and naggingly argued about and worked through the minute details of the dinner/dance had a HUGE success with everything to do with the Saturday night event. The appetizers were just right. The food was good and plentiful. The tables were filled. The conversation was unending. And the music was absolutely great. It certainly appeared as if everyone was very happy they were able to be there. Teacher Dr. Smith (chemistry) and his wife (taught many of you at Wilson) were there to celebrate with us. There was much dancing, and much talking. It’s been a long time since I’ve seen so many old-timers still awake so late at night. Wife Vicki from the Class of 1968 had a great time at our reunion events as I suppose most other spouses also did. Perhaps some of the rest of you will write to share your thoughts, both good and not so good. If you’re in the eGroup, simply address your email to AuburnClassOf66@yahoogroups.com. I’d like to hear from others. Others not in the eGroup can write to me at HTallak@aol.com and I’ll forward your eMail to the group.